GDPR: What’s the big whoop? This past week, the European Union’s General Data Protection Regulation (GDPR) initiative kicked in. But what does it mean for businesses that operate in the EU region? And what are the prospects for GDPR-like privacy coming to the USA anytime soon? The “right to be forgotten” means data subjects can request their information to be erased. The right to “data portability” is also a new factor. Data subjects now have the right to have data transferred to a third-party service provider in machine-readable format. 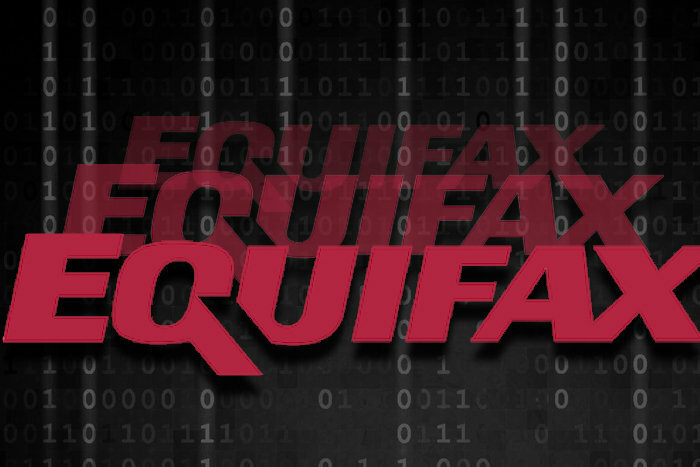 However, this right arises only when personal data is provided and processed on the basis of consent, or when necessary to perform a contract. Privacy impact assessments and “privacy by design” are now legally required in certain circumstances under GDPR, too. Businesses are obliged to carry out data protection impact assessments for new technologies. “Privacy by design” involves accounting for privacy risk when designing a new product or service, rather than treating it as an afterthought. A recent study investigated how much customer data will still be usable after GDPR provisions are implemented. Research was done involving more than 30 companies that have already gone through the process of making their data completely GDPR-compliant. The sobering finding: Nearly 45% of EU audience data is being lost due to GDPR provisions. One of the biggest changes is that cookie IDs disappear, which is the basis behind so much programmatic and other data-driven advertising both in Europe and in the United States. New platforms are emerging to help publishers manage customer consent for “privacy by design,” but the situation is sure to become more challenging in the ensuing months and years as compliance tracking the regulatory authorities ramps up. It appears that some companies are being a little less proactive than is advisable. A recent study by compliance consulting firm CompliancePoint shows that a large contingent of companies, simply put, aren’t ready for GDPR. As for why they aren’t, nearly half report that they’re taking a “wait and see” attitude to determine what sorts of enforcement actions ensue against scofflaws. 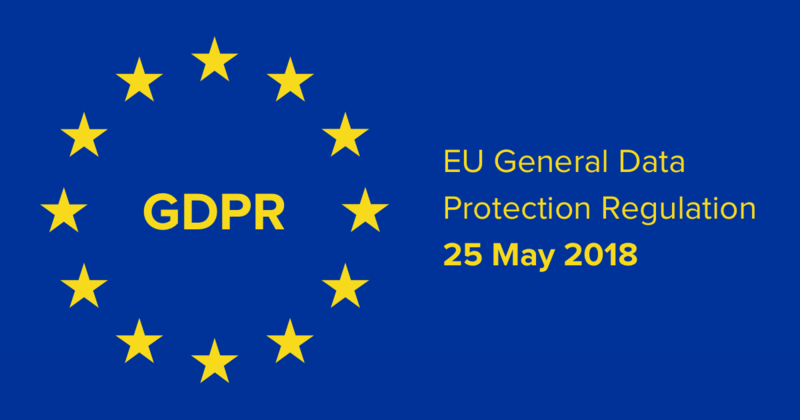 Some marketers admit that their companies aren’t ready due to their own lack of understanding of GDPR issues, while quite a few others claim simply that they’re unconcerned. I suspect we’re going to get a much better understanding of the implications of GDPR over the coming year or so. It’ll be good to check back on the status of implementation and enforcement measure by this time next year. Recently I read a column in MediaPost by contributing writer Ted McConnell (The Block Chain [sic] Gang, 3/8/18) that seemed pretty wide of the mark in terms of some of its (negative) pronouncements about blockchain technology. Not being an expert on the subject, I shared the column with my brother, Nelson Nones, who is a blockchain technology specialist, to get his “read” on the article’s POV. Nelson cited four key areas where he disagreed with the positions of the column’s author – particularly in the fallacy of conflating blockchain technology – the system of keeping records which are impossible to falsify – with cryptocurrencies (systems for trading assets). 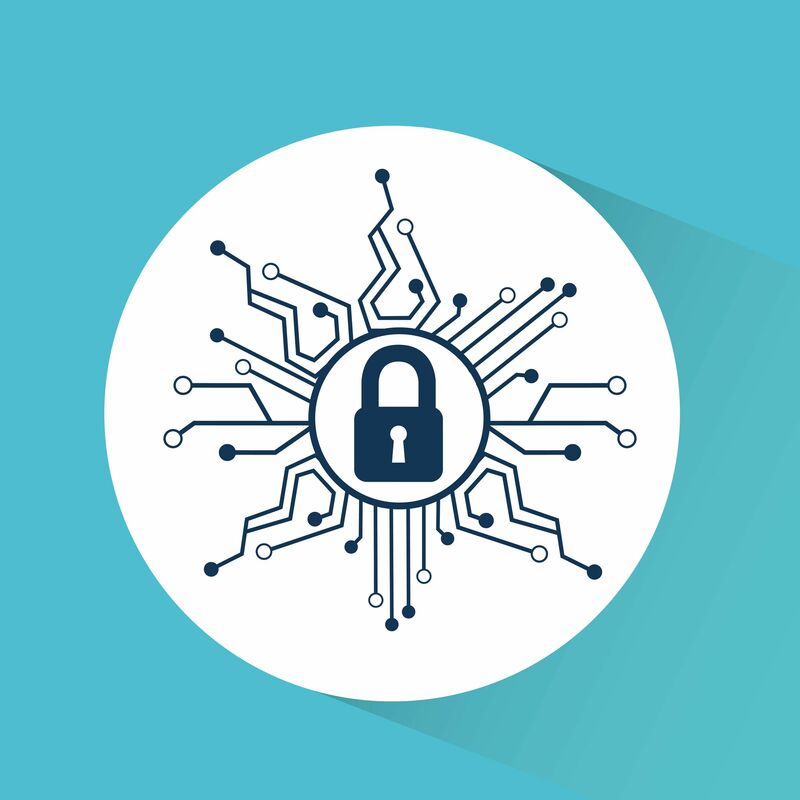 But the bigger aspect, Nelson pointed out, is that the MediaPost column reflects a general degree of negativity that has crept into the press recently about blockchain technology and its potential for solving business security challenges. He noted that blockchain technology is in the midst of going through the various stages of Gartner’s well-known “hype cycle” – a model that charts the maturity, adoption and social application of emerging technologies. Interested in learning more about this larger issue, I asked Nelson to expand on this aspect. Presented below is what he reported back to me. His perspectives are interesting enough, I think, to share with others in the world of business. Most folks in the technology world – and many business professionals outside of it – are familiar with the “hype cycle.” It’s a branded, graphic representation of the maturity, adoption and social application of technologies from Gartner, Inc., a leading IT research outfit. If the hype cycle is to be believed, the Trough of Disillusionment cannot be avoided; but from a technology provider’s perspective it seems a dreadful place to be. 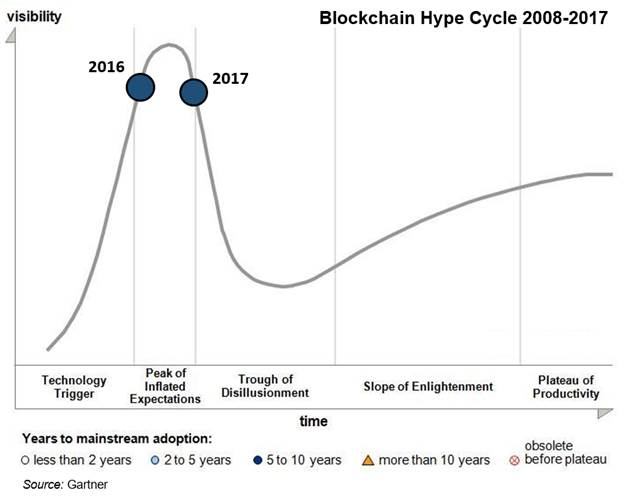 Gartner publishes dozens of these “hype cycles,” refreshing them every July or August. They mark the progression of specific technologies along the curve – as well as predicting the number of years to mainstream adoption. Below is an infographic I’ve created which plots Gartner’s view for cloud computing overlaid by a plot of global public cloud computing revenues during that time, as reported by Forrester Research, another prominent industry observer. This infographic provides several interesting insights. 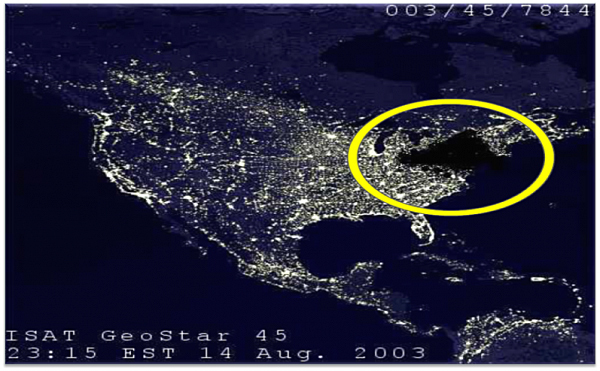 For starters, cloud computing first appeared on Gartner’s radar in 2008. In hindsight that seems a little late — especially considering that Salesforce.com launched its first product all the way back in 2000. Amazon Web Services (AWS) first launched in 2002 and re-launched in 2006. Perhaps Gartner was paying more attention to Microsoft, which announced Azure in 2008 but didn’t release it until 2010. Microsoft, Amazon, IBM and Salesforce are the top four providers today, holding ~57% of the public cloud computing market between them. Cloud computing hit the peak of Gartner’s hype cycle just one year later, in 2009, but it lingered at or near the Peak of Inflated Expectations for three full years. All the while, Gartner was predicting mainstream adoption within 2 to 5 years. 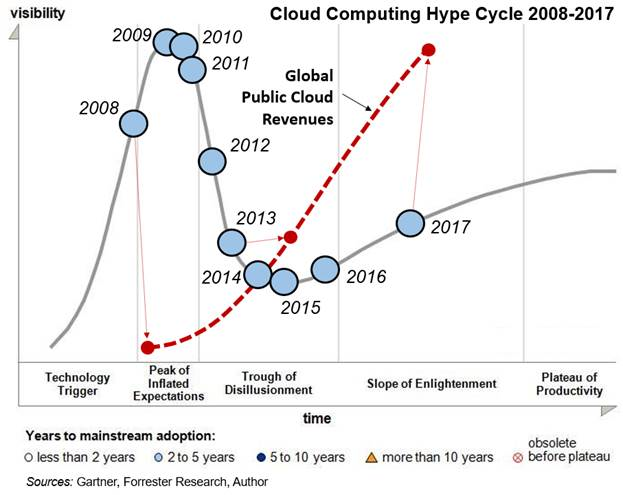 Indeed, they have made the same prediction for ten years in a row (although I would argue that cloud computing has already gained mainstream market adoption). It also turns out that the Trough of Disillusionment isn’t quite the valley of despair that Gartner would have us believe. In fact, global public cloud revenues grew from $26 billion during 2011 to $114 billion during 2016 — roughly half the 64% compound annual growth rate (CAGR) during the Peak of Inflated Expectations, but a respectable 35% CAGR nonetheless. Indeed, there’s no evidence here of waning market interest – nor did an industry shakeout occur. With the exception of IBM, the leading producers in 2008 remain the leading producers today. All in all, it seems the hype curve significantly lagged the revenue curve during the plunge into the Trough of Disillusionment. Notably, cryptocurrencies first appeared in 2014, just past the peak of the cycle, even though the first Bitcoin network was established in 2009. Blockchain is the distributed ledger which underpins cryptocurrencies and was invented at the same time. All the same, blockchain seems to be progressing through the curve at three times the pace of cloud computing. If cloud computing’s history is any guide, blockchain provider revenues are poised to outperform the hype curve and multiply into some truly serious money during the next five years. It’s reasonable to think that blockchain has been passing through a phase of “irrational exuberance” lately, but it’s equally reasonable to believe that industry experts are overly cautious and a bit late to the table. So that’s one specialist’s view. What are your thoughts on where we are with blockchain technology? Please share your perspectives with other readers here. It doesn’t take a genius to realize that the typical American home contains more than a few digital devices. But it might surprise some to learn just how many devices there actually are. The survey, which was conducted by technology research company ReportLinker in April 2017, found that TVs remain the #1 item … but the number of digital devices in the typical home is also significant. The ReportLinker survey also studied attitudes adults have about technology and whether it poses risks for their children. Parents who allow their children to use digital devices in their bedrooms report higher daily usage by their children compared to families who do not do so – around three hours of usage per day versus two. On balance, parents have positive feelings about the impact technology is having on their children, with ~40% of the respondents believing that technology promotes school readiness and cognitive development, along with a higher level of technical savvy. On the other hand, around 50% of the respondents feel that technology is hurting the “essence” of childhood, and causing kids to spend less time playing, spending time outdoors, or reading. A smaller but still-significant ~30% feel that their children are more isolated, because they have fewer social interactions than they would have had without digital devices in their lives. For more findings from the ReportLinker survey, follow this link.